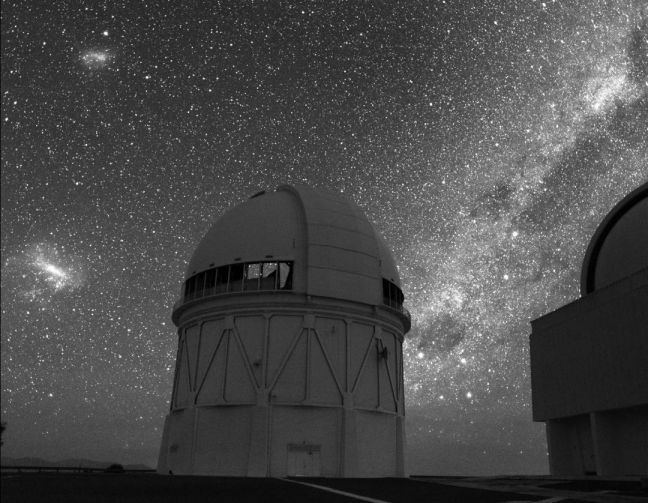 Explanation: High atop a Chilean mountain lies one of the premier observatories of the southern sky: the Cerro Tololo Inter-American Observatory (CTIO). Pictured above is the dome surrounding one of the site's best known instruments, the 4-meter Blanco Telescope. Far behind the dome are thousands of individual stars and diffuse light from three galaxies: the Small Magellanic Cloud (upper left), the Large Magellanic Cloud (lower left), and our Milky Way Galaxy (right). Also visible just to Blanco's right is the famous superposition of four bright stars known as the Southern Cross. A single 20 second exposure, this digital image was recorded with a sensitive detector intended for astronomical imaging. The observatory structures are lit solely by starlight.